The screw portion of the WEMCO® Screw Centrifugal impeller performs as an inducer, pulling liquid into the impeller, resulting in low NPSH requirements. The single vane impeller of the WEMCO® Screw Centrifugal pump creates a single channel flow, allowing for larger solids passage. 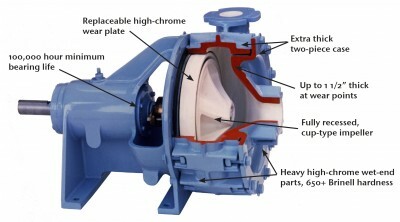 The large solids passage provides better solids handling capabilities than any other pump type. The steep head-capacity curve provides ample reserve pressure to clear temporary clogs. The combination of a low NPSH requirement and large solids channels provides a powerful pump for handling thick sludges. 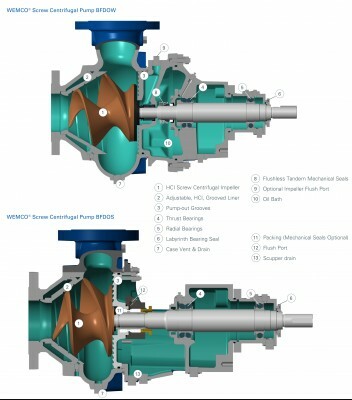 The steep head-capacity curve of the WEMCO® Screw Centrifugal pump also allows for pumping of varying sludge consistencies without the need to change speed. An additional benefit is the reserved head for clearing temporary line blockages. Consistent impeller to liner clearance is imperative to the performance of the pump. 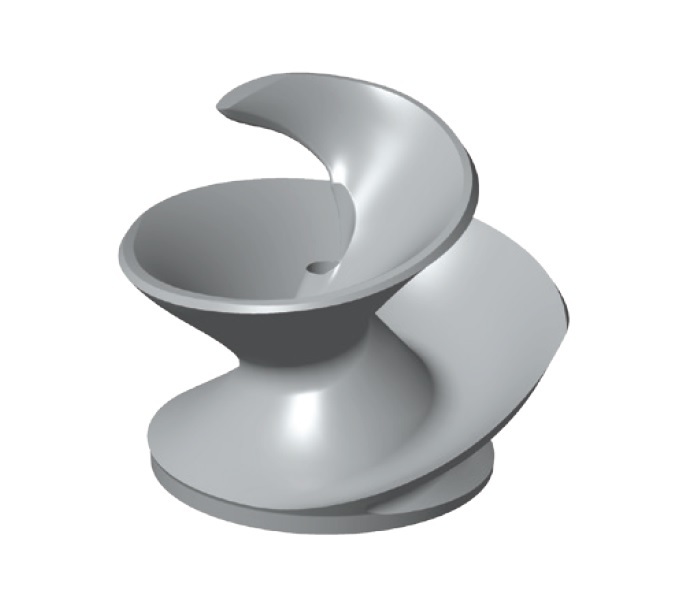 As the pump components wear, clearance between the impeller and liner can be adjusted to ensure optimal performance. With this in mind, Weir Specialty Pumps constructs the WEMCO Model C wet-end parts from Ni-Hard or Hi-Chrome – two of the industry’s toughest, most abrasion-resistant alloys. Standard hardness ranges from 650+ Bhn.